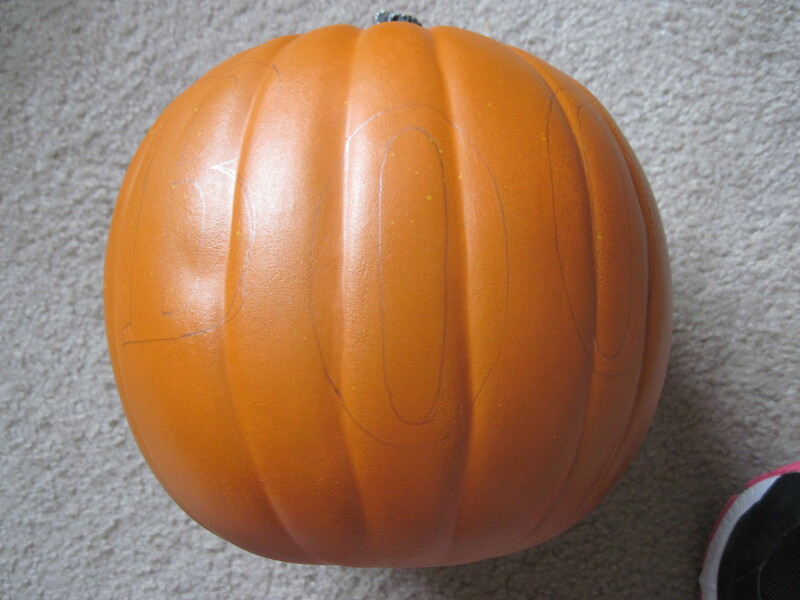 We made a Boo Pumpkin. My cousin, Candace ,would be so proud. After all, she is the one who introduced me to this addiction website. I’ve determined that it is perfect for people like me who want to look crafty without having to put too much thought into it. I mean, what we’re really doing here is ripping off other people’s ideas and making them look like we simply came up with it in between zillions of loads of laundry, nursing a baby, taking the other kid to and from school and making dinner. With that said, I shall give credit to my pinspiration…yes I just did that. I must find numerous ways to make you groan with pinterest terms 🙂 Our idea was from this pin. I say “our” here because I thought this would be a fun project for Hannah and I. Hannah helped me purchase the supplies from Michael’s first and then she helped pick out and place the buttons on the pumpkin. You’ll also need a hot glue gun, a paper stencil (optional) and a pencil. Step 2: I printed out a “Boo” template on cardstock using Bodoni MT Bold font (I just used Microsoft Publisher). I cut out the inside of the letters to make a stencil. Step 4: Use the different sizes of buttons to fill in the letters and glue them on. This is where you can tell your 4 year old, “Find me a small button” and “What size button do you think we need right here?” Ah, learning. Pintereducation. 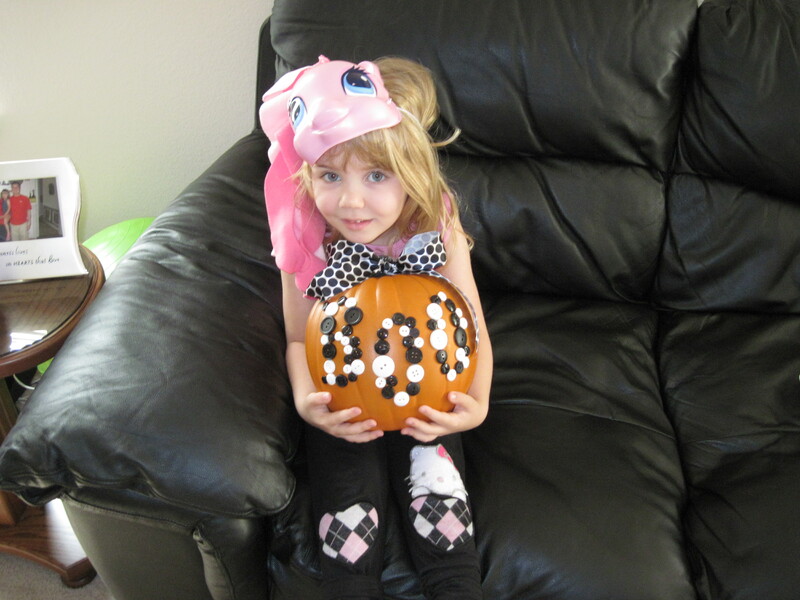 Step 5: Tie your ribbon into a bow on the pumpkin’s stem. We did a black and white theme. Our pinspiration used all black buttons which I also think is very cute. I think this is a fun Halloween project you can do with your kiddo (much more fun that getting your hands into pumpkin guts) AND you don’t have to throw the pumpkin away! Just stick it into your Halloween box when you put your other decor stuff away and enjoy again next year.